You consider buying, selling, managing, leasing or identifying the optimal retail space? Our retail advisors are committed to protecting your investments and the brand throughout every phase of the real estate process. Access to local market knowledge around the world in both capital and secondary cities has enabled Colliers to develop strong landlord and retail representation. Our relationship with top multi-national retailers combined with local retail expertise brings a wealth of new opportunities to our clients. Committed to maximizing the return on investment for developers of retail projects, Colliers creates value for clients by providing advisory services from the concept development phase, through the management of the project to implementation of the marketing and leasing process, and finally to the investment sale. 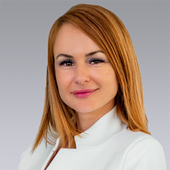 Dimitrinka has more than 11 years of experience in Colliers, specialized in retail real estate consultancy services. She has been having a key role in the Retail Services team, providing landlord representation services for major projects such as: Sofia Ring Mall (68,000 sqm GLA), The Mall (66,000 sqm GLA), Grand Mall Varna (50,000 sqm GLA), Burgas Plaza (27,000 sqm GLA), Mall Plovdiv (20,000 sqm GLA), Galleria Burgas (36,000 sqm GLA), Galleria Stara Zagora (20,700 sqm GLA), Jumbo Plaza (30,000 sqm GLA) and Retail Park Varna (15,000 sqm GLA). Dimitrinka has worked closely with companies in various industries and developed long-term relationships with most of the retail operators on the Bulgarian and international market, such as H&M, Sport Vision, Benefit Systems, Orange, Esprit, Pierre Cardin, Humanic, Grand Optics, Andrews/, Lagardere, Adidas, Walltopia, Zora, Sephora, DSK bank, to mention a few.